Portuguese ( português , língua portuguesa) is a Romance language originated in what is today Galicia (Spain) and northern Portugal. It is the official language of Angola, Brazil, Cape Verde, Guinea-Bissau, Mozambique, Portugal and São Tomé and Príncipe, and co-official with Chinese in the Chinese S.A.R. of Macau and Tetum in East Timor. Portuguese is ranked sixth among the world's languages in number of native speakers (over 200 million), and first in South America (186 million, over 51% of the population). It is also a major lingua franca in Africa. It spread worldwide in the 15th and 16th century as Portugal set up a vast colonial and commercial empire (1415–1999), spanning from Brazil in the Americas to Macau in China. In that colonial period, many Portuguese creoles appeared around the world, especially in Africa, Asia and the Caribbean. Portuguese is often nicknamed The language of Camões, after the author of the Portuguese national epic The Lusiadas; The last flower of Latium ( Olavo Bilac); and The sweet language by Cervantes. Portuguese is the official language in Angola, Brazil, Portugal and São Tomé and Príncipe as first language, and the most widely used language in Mozambique. It is also one of the official languages of East Timor (with Tetum) and of the Chinese S.A.R. of Macau (with Chinese). It is widely spoken, but not official, in Andorra, Luxembourg, Namibia and Paraguay (in the latter country there were 112,520 native Portuguese speakers according to the 2002 census). Portuguese Creoles are the mother tongue of Cape Verde and part of Guinea-Bissau's population. In Cape Verde most also speak standard Portuguese and have a native level language usage. Large Portuguese-speaking immigrant communities exist in many cities around the world, including Montreal and Toronto in Canada; Paris in France; Asunción in Paraguay; and Boston, New Bedford, Cape Cod, Fall River, Honolulu, Houston, Newark, New York City, Orlando, Miami, Providence, Sacramento in the United States; Buenos Aires in Argentina, Uruguay, and in Japan. Other countries where speakers can be found include in Andorra, Belgium, Bermuda, Switzerland and some communities in India such as Goa. Portuguese is spoken by about 188 million people in South America, 17 million in Africa, 12 million in Europe, 2 million in North America and 610,000 in Asia. The CPLP or Community of Portuguese Language Countries is an international organization consisting of the eight independent countries which have Portuguese as an official language. Portuguese is also an official language of the European Union, Mercosul and the African Union (one of the working languages) and one of the official languages of other organizations. The Portuguese language is gaining popularity in Africa, Asia, and South America as a second language for study. 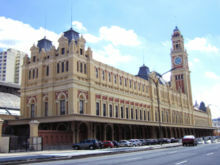 Estação da Luz, site of the museum in São Paulo, Brazil. The language is also starting to gain popularity in Asia, mostly due to East Timor's boost in the number of speakers in the last five years, and Macau is becoming the Chinese centre for learning Portuguese, where in early 21st century, the language use was in decline, today it is growing as it became a language for opportunity due to increased Chinese diplomatic and financial ties with the Portuguese speaking countries. In March of 2006, the Museum of the Portuguese Language, an interactive museum about the Portuguese language, was founded in São Paulo, Brazil, the city with the largest number of Portuguese speakers in the world. Portuguese is a pluricentric language. It has two main groups of dialects, those of Brazil and those of the Old World. For historical reasons, the dialects of Africa and Asia are generally closer to those of Portugal than the Brazilian dialects, although in some aspects of their phonology, especially the pronunciation of unstressed vowels, they resemble Brazilian Portuguese more than European Portuguese. They have not been studied as exhaustively as European and Brazilian Portuguese. In various parts of Africa, Asia, and the Americas, Portuguese creoles are spoken, but they are independent languages which should not be confused with Portuguese itself. Brazil: vazar - from Portuguese "to leak"
Between Brazilian Portuguese, particularly in its most informal varieties, and European Portuguese, there can be considerable differences in grammar, as well. The most prominent ones concern the placement of clitic pronouns, and the use of subject pronouns as objects in the third person. Non-standard inflections are also common in colloquial Brazilian Portuguese. Galician and the Fala, its closest relatives. See below. Spanish, the major language closest to Portuguese. See also Differences between Spanish and Portuguese. Mirandese, another West Iberian language spoken in Portugal. Judeo-Portuguese and Judeo-Spanish, languages spoken by Sephardic Jews, which remained close to Portuguese and Spanish. A distinctive feature of Portuguese is that it preserved the stressed vowels of Vulgar Latin, which other Romance languages diphthongized; cf. Fr. pierre, Sp. piedra, Port. pedra, from Lat. petra; or Sp. fuego, It. fuoco, Port. fogo, from Lat. focum. Another characteristic of early Portuguese was the loss of intervocalic l and n, sometimes followed by the merger of the two surrounding vowels, or by the insertion of an epenthetic vowel between them: cf. Lat. salire, tenere, catena, Sp. salir, tener, cadena, Port. sair, ter, cadeia. When the elided consonant was n, it often nasalized the preceding vowel: cf. Lat. manum, rana, bonum, Port. mão, rãa (now rã), bõo (now bom). This process was the source of most of the nasal diphthongs which are typical of Portuguese. In particular, the Latin endings -ane-, -anu- and -one- became -ão in most cases: cf. Lat. canem, germanum, rationem with Modern Port. cão, irmão, razão, and their plurals cães, irmãos, razões. See Portuguese Vocabulary: From Latin to Portuguese, for other sound changes. She always shuts the window before dining. Note that some of the lexical divergence above actually comes from different Romance languages using the same root word with different semantic values. Portuguese for example has the word fresta, which is a cognate of French fenêtre or Italian finestra and so on, but now means "slit" as opposed to "window." Likewise, Portuguese also has the word cear, a cognate of Italian cenare and Spanish cenar, but uses it in the sense of "to have a late supper", while the most frequent word meaning "to dine" is actually jantar (related to archaic Sp. yantar) due to semantic changes in the 19th Century. Galician has both fiestra (from medieval fẽestra which is the ultimate origin of standard Portuguese fresta), and the less frequently used xanela. Like the northern dialects of Portuguese, it still uses cear with its original meaning of "dining". The closest language to Portuguese is Galician, spoken in the autonomous community of Galicia (northwestern Spain). The two were at one time a single language, known today as Galician-Portuguese, but since the political separation of Portugal from Galicia they have diverged somewhat, especially in pronunciation and vocabulary. Nevertheless, the core vocabulary and grammar of Galician are still noticeably closer to Portuguese than to Spanish. In particular, it uses the future subjunctive, the personal infinitive, and the synthetic pluperfect (see the section on the grammar of Portuguese, below). Mutual intelligibility is good between Galicians and northern Portuguese, but poorer between Galicians and speakers from central Portugal. The linguistic status of Galician with respect to Portuguese is controversial. Some authors, such as Lindley Cintra, consider that they are still dialects of a common language, in spite of superficial differences in phonology and vocabulary. Others, such as Pilar Vázquez Cuesta, argue that they have become separate languages due to major differences in phonetics and vocabulary usage, and, to a lesser extent, morphology and syntax. The official position of the Galician Language Institute is that Galician and Portuguese should be considered independent languages. The standard orthography takes advantage of the divergent features of the phonology of Galician to emphasize its differences from Portuguese, insisting on a phonetic spelling, and rejecting for example Portuguese graphic conventions like the graphemes nh, lh, j in favour of ñ, ll, x. See also Reintegrationism. The Fala language is another descendant of Galician-Portuguese, spoken by a small number of people in the Spanish towns of Valverdi du Fresnu, As Ellas and Sa Martín de Trebellu (autonomous community of Extremadura, near the border with Portugal). Beginning in the 16th century, the extensive contacts between Portuguese travelers and settlers, African slaves, and local populations led to the appearance of many pidgins with varying amounts of Portuguese influence. As these pidgins became the mother tongue of succeeding generations, they evolved into fully fledged creole languages, which remained in use in many parts of Asia and Africa until the 18th century. Many languages have borrowed words from Portuguese, such as Indonesian, Malay, Konkani, Tetum, Xitsonga, Papiamentu, Japanese, Lanc-Patuá (spoken in northern Brazil - now extinct) and Sranang Tongo (spoken in Suriname). It left a strong influence on the língua brasílica, a Tupi-Guarani language which was the most widely spoken in Brazil until the 18th century, and on the language spoken around Sikka in Flores Island, Indonesia. In nearby Larantuka, Portuguese is used for prayers in the Tuan Ma ritual. The Japanese-Portuguese dictionary Nippo Jisho (1603) was the first dictionary of Japanese in a European language, a product of Jesuit missionary activity in Japan. Building on the work of earlier Portuguese missionaries, the Dictionarium Anamiticum, Lusitanum et Latinum (Annamite-Portuguese-Latin dictionary) of Alexandre de Rhodes (1651) introduced quốc ngữ, the modern orthography of Vietnamese, which is based on the orthography of 17th-century Portuguese. The Romanization of Chinese was also influenced by the Portuguese language (among others), particularly regarding Chinese surnames; one example is "Mei". Arriving in the Iberian Peninsula in 218 BC, the Romans brought with them the Latin language, from which all Romance languages descend. In the 2nd century BC, southern Lusitania was already Romanized. Strabo, a 1st century Greek geographer, remarks in his Geographia "encyclopedia": "they have adopted the Roman customs, and they no longer remember their own language." The language was spread by arriving Roman soldiers, settlers and merchants, who built Roman cities mostly near the settlements of previous civilizations. Between 409 A.D. and 711, as the Roman Empire collapsed in Western Europe, the Iberian Peninsula was conquered by Germanic peoples ( Migration Period). The newcomers, mainly Suevi and Visigoths, quickly adopted late Roman culture and the Vulgar Latin dialects of the peninsula. After the Moorish invasion of 711, Arabic became the administrative language in the conquered regions, but most of the population continued to speak a form of Romance commonly known as Mozarabic. The influence exerted by Arabic on the Romance dialects spoken in the Christian kingdoms of the north was small, affecting mainly their lexicon. The earliest surviving records of a distinctively Portuguese language are administrative documents of the 9th century, still interspersed with many Latin phrases. Today this phase is known as Proto-Portuguese (between the 9th and the 12th century). Portugal was formally recognized as an independent nation by the Kingdom of Leon in 1143, with Afonso Henriques as king. In the first period of Old Portuguese - Portuguese-Galician Period (from the 12th to the 14th century) - the language gradually came into general use. Previously it had been the language of preference for lyric poetry in Christian Iberia, much like Occitan was the language of the poetry of the troubadors. In 1290, king Denis created the first Portuguese University in Lisbon (the Estudo Geral) and decreed that Portuguese, then simply called the "Vulgar language" should be known as the Portuguese language and used officially. In the second period of Old Portuguese, from the 14th to the 16th century, with the Portuguese discoveries, the language was taken to many regions of Asia, Africa and the Americas (nowadays, the great majority of Portuguese speakers live in Brazil, in South America). By the 16th century it had become a lingua franca in Asia and Africa, used not only for colonial administration and trade but also for communication between local officials and Europeans of all nationalities. Its spread was helped by mixed marriages between Portuguese and local people, and by its association with Roman Catholic missionary efforts, which led to the formation of a creole called cristão ("Christian") in many parts of Asia. The language continued to be popular in parts of Asia until the 19th century. Some Portuguese-speaking Christian communities in India, Sri Lanka, Malaysia, and Indonesia preserved their language even after they were isolated from Portugal. The end of the Old Portuguese period was marked by the publication of the Cancioneiro Geral de Garcia de Resende, in 1516. The early times of Modern Portuguese, which spans from the 16th century to present day, were characterized by an increase in the number of erudite words borrowed from Classical Latin and Classical Greek during the Renaissance, which greatly enriched the lexicon. Almost 90% of the lexicon of Portuguese is derived from Latin. Nevertheless, thanks to the Moorish occupation of the Iberian Peninsula during the Middle Ages, and to the participation of Portugal in the Age of Discovery, it has adopted loanwords from all over the world. Very few Portuguese words can be traced to the pre-Roman inhabitants of Portugal, which included the Phoenicians, Carthaginians, Iberians, Lusitanians, and Celts. Some notable examples are abóbora "pumpkin" and bezerro "year-old calf", from Iberian languages; cerveja "beer", from Celtic; saco "bag", from Phoenician; and cachorro "dog, puppy", from Basque. In the 5th century the Iberian Peninsula (the former Roman region of Hispania) was conquered by the Suevi, Visigoths and Alans, Germanic tribes who had been displaced from Central Europe by the Huns. As they adopted the Roman civilization and language, however, these people contributed only a few words to the lexicon, mostly related to warfare — such as espora "spur", estaca "stake", and guerra "war", from Gothic *spaúra, *stakka, and *wirro, respectively. Between the 9th and the 15th centuries Portuguese acquired about 1000 words from Arabic by influence of Moorish Iberia. They are often recognizable by the initial Arabic article a(l)-, and include many common words such as aldeia "village" from التجارية aldaya, alface "lettuce" from الخس alkhass, armazém "warehouse" from المخزن almahazan, and azeite "olive oil" from زيت azzait. From Arabic came also the grammatically peculiar word oxalá "God willing". The name of the Portuguese town of Fátima, where the Virgin Mary is said to have appeared, is originally the name of one of the daughters of Muhammad. Starting in the 15th century, the Portuguese maritime explorations led to the introduction of many loanwords from Asian languages. For instance, catana "cutlass" from Japanese katana; corja "rabble" from Malay kórchchu; and chá "tea" from Chinese chá. From South America came batata "potato", from Taino; ananás and abacaxi, from Tupi-Guarani naná and Tupi ibá cati, respectively (two species of pineapple), and tucano " toucan" from Guarani tucan. From the 16th to the 19th century, the role of Portugal as intermediary in the Atlantic slave trade, with the establishment of large Portuguese colonies in Angola, Mozambique, and Brazil, Portuguese got several words of African and Amerind origin, especially names for most of the animals and plants found in those territories. While those terms are mostly used in the former colonies, many became current in European Portuguese as well. From Kimbundu, for example, came kifumate → cafuné "head caress", kusula → caçula "youngest child", marimbondo "tropical wasp", and kubungula → bungular "to dance like a wizard". Finally, it has received a steady influx of loanwords from other European languages. For example, melena "hair lock", fiambre "wet-cured ham" (in contrast with presunto "dry-cured ham" from latin prae-exsuctus "dehydrated"), and castelhano "Castilian", from Spanish; colchete/crochê "bracket"/"crochet", paletó "jacket", batom "lipstick", and filé/filete "steak"/"slice" respectively, from French crochet, paletot, bâton, filet; macarrão "pasta"", piloto "pilot", carroça "carriage", and barraca "barrack", from Italian maccarone, pilotto, carrozza, barracca; and bife "steak", futebol, revólver, estoque, folclore, from English beef, football, revolver, stock, folklore. Portuguese is written with the Latin alphabet, and makes use of the acute accent, the circumflex accent, the grave accent, the tilde, and the cedilla, to denote stress, vowel height, nasalization, and other sound changes. Brazilian Portuguese also uses the diaeresis mark. Accented letters and digraphs are not counted as separate characters for collation purposes. There are some differences between the orthographies of Brazil and other Portuguese language countries. One of the most pervasive is the use of acute accents in the European/African orthography in many words such as sinónimo, where the Brazilian orthography has a circumflex accent, sinônimo. Another important difference is that Brazilian spelling often lacks c or t before c, ç, or t, where the European orthography has them; for example, cf. Brazilian fato with European facto, "fact", or Brazilian objeto with European objecto, "object". Some of these spelling differences reflect differences in the pronunciation of the words, but others are merely graphic. There is a maximum of 9 oral vowels and 19 consonants, though some varieties of the language have fewer phonemes (Brazilian Portuguese has only 7 oral vowel phonemes). There are also five nasal vowels, which some linguists regard as allophones of the oral vowels, ten oral diphthongs, and five nasal diphthongs. To the seven vowels of Vulgar Latin, European Portuguese has added two near central vowels, one of which tends to be elided in rapid speech, like the e caduc of French. The high vowels /e o/ and the low vowels /ɛ ɔ/ are four distinct phonemes, and they alternate in various forms of apophony. 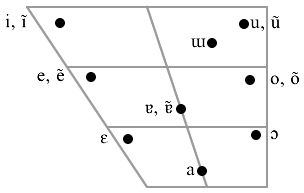 Like Catalan, Portuguese uses vowel quality to contrast stressed syllables with unstressed syllables: isolated vowels tend to be raised, and in some cases centralized, when unstressed. Nasal diphthongs occur mostly at the end of words. At the end of a syllable, the phoneme /l/ has the velarized allophone [ɫ] in European Portuguese, like in the Received Pronunciation of English. Brazilian Portuguese has the allophone [w] instead ( L-vocalization). In many parts of Brazil and Angola, /ɲ/ is pronounced as a nasal glide [j̃] that nasalizes the preceding vowel, so that for instance /'niɲu/ is pronounced ['nĩj̃u]. There is considerable dialectal variation in the value of the rhotic phonemes /ɾ/ and /ʁ/. See Guttural R in Portuguese, for details. dúvida /ˈduvidɐ/ "doubt" (noun) vs. duvida /duˈvidɐ/ "he doubts"
Tone is not lexically significant in Portuguese, but phrase- and sentence-level tone are important. There are of six dynamic tone patterns that affect entire phrases, which indicate the mood and intention of the speaker such as implication, emphasis, reservation, etc. As in most Romance languages, interrogation is expressed mainly by sharply raising the tone at the end of the sentence. It is a synthetic, fusional, nominative-accusative language. Nouns, adjectives and articles are only moderately inflected (though moreso than in English). There are two grammatical genders, masculine and feminine, and two grammatical numbers, singular and plural. Case marking on nouns has been completely lost, though a trace of it survives in the personal pronouns. Verbs are highly inflected, normally having over 50 different forms. There are numerous periphrastic verbal constructions, as well. There are three tenses, past, present and future; three moods, indicative, subjunctive, and imperative; and three aspects, imperfect, perfective, and progressive (perfective and progressive forms are mostly periphrastic). It has a conditional form distinct from the subjunctive, and two verbs "to be". It is a null-subject language. Typical word order is SVO, though it is generally less strict than in English. When you are older, you will understand. Personal infinitive: it is possible for an infinitive verb to agree with its subject in person and number, often showing who is supposed to perform a certain act; cf. É melhor voltares "It is better [for you] to go back. ", É melhor voltarmos "It is better [for us] to go back." Perhaps for this reason, infinitive clauses replace subjunctive clauses more often in Portuguese than in other Romance languages. The Portuguese present perfect has an iterative sense which is unique among the Romance languages. It denotes an action or a series of actions which began in the past and are expected to keep repeating in the future. For instance, the meaning of Tenho tentado falar com ela may be closer to "I have been trying to talk to her" than to "I have tried to talk to her", depending on the context. On the other hand, the correct translation of the question "Have you heard the latest news?" is not *Tem ouvido a última notícia?, but Ouviu a última notícia?, since no repetition is implied. Com pouca corrupção crê que é a Latina. kõ ˈpokɐ kuʁupˈsɐ̃ũ ̯ kɾe ki̯ɛ ɐ lɐˈtinɐ kõ ˈpowka koxupˈsɜ̃w̃ kɾe ki ɛ a laˈtʲĩna Could mistake for Latin, passably declined.